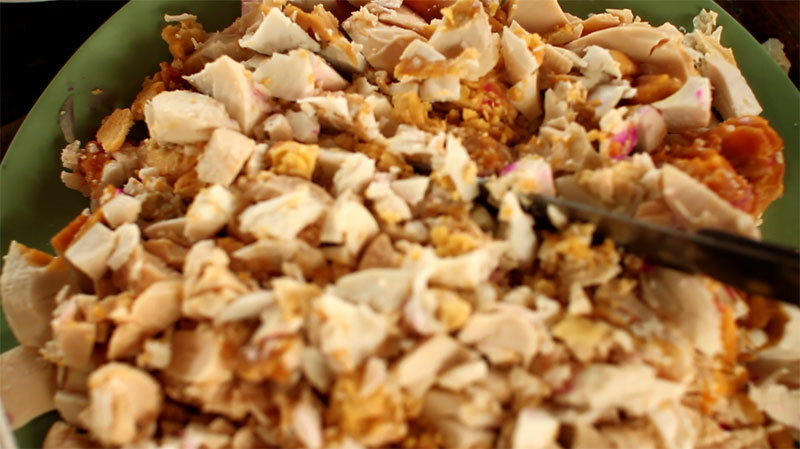 As mentioned in my previous blog post, here is the recipe for super-easy salted egg salad, a Filipino staple especially for informal gatherings (such as a beach picnic), and is great with grilled food. You can adjust the quantities if needed. Some people like lots of tomatoes with a bit of salted egg, while others love munching on the onions and eggs. The quantity listed below is good for 3 people. Slice the red egg into two, then scoop out the preserved egg using a spoon. Chop up into smaller pieces if desired. Set aside. 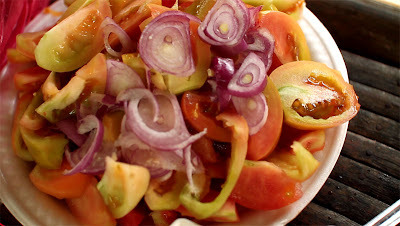 Slice the tomatoes as well as the onion and mix these two together. Serve the red eggs in a separate bowl, and the onion-tomato mix in another. This helps prevent the eggs from becoming soggy due to the tomato's water content, plus people can get the portions they want.